The beans can be processed in a variety of ways. Common forms of soy (or soya) include soy meal, soy flour, soy milk, tofu, textured vegetable protein (TVP, which is made into a wide variety of vegetarian foods, some of them intended to imitate meat), tempeh, soy lecithin and soybean oil. Soybeans are also the primary ingredient involved in the production of soy sauce (shoyu). 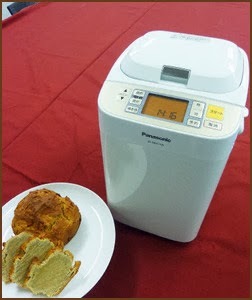 Soy flour is made by roasting the soybean, removing the coat, and grinding into a flour. 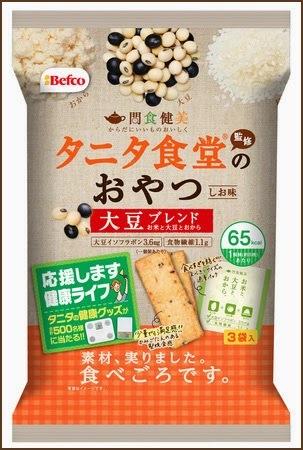 Soy flour is manufactured with different fat levels. "Natural or full-fat soy flour is made from unextracted, dehulled beans, and contains about 18% to 20% oil." Its high oil content requires the use of a specialized Alpine Fine Impact Mill to grind rather than the usual hammer mill. 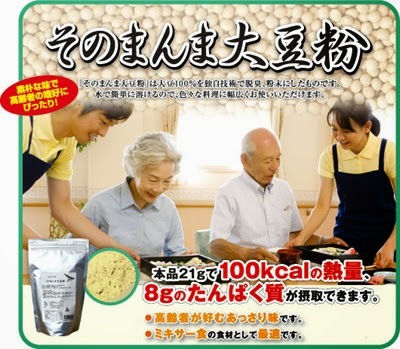 Full-fat soy flour has a lower protein concentration then defatted flour.
. WKD : daizu 小豆 soy beans .
. kinako　黄な粉 "yellow flour" from roasted soy beans . The latest fad is now flour from soybeans for noodles and baking. 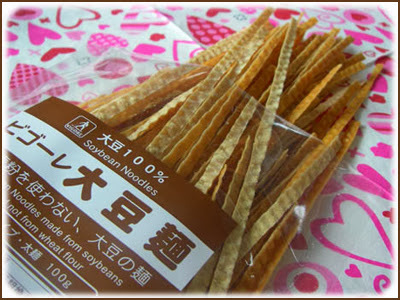 noodles made from percent soybean flour. They have less sugar than normal Chinese noodles, less calories and more fibers, so they are good for your diet. Sugar is reduced by about 60 percent, but the isoflavones are available. ***** . WKD : daizu 小豆 soy beans . Young tender leaves of mustard greens are used in salads or mixed with other salad greens. Older leaves with stems may be eaten fresh, canned or frozen, for potherbs, and to a limited extent in salads. Mustard greens are often cooked with ham or salt pork, and may be used in soups and stews. Although widely and extensively grown as a vegetable, it is being grown more for its seeds which yield an essential oil and condiment. Easier to grow than Black Mustard (B. nigra), it has nearly replaced it in brown mustard preparations since 1945. Mustard Oil is one of the major edible oils in India, the fixed oil content of rai varying between 28.6% and 45.7%. Oil is also used for hair oil, lubricants and, in Russia, as a substitute for olive oil. Adding 1.1–2.2% mustard oil to fresh apple cider retards fermentation. Seed residue is used as cattle feed and in fertilizers. Reported to be anodyne, apertif, diuretic, emetic, rubefacient, and stimulant, Indian Mustard is a folk remedy for arthritis, footache, lumbago, and rheumatism (Duke and Wain 1981). Seed used for tumors in China. Root used as a galactagogue in Africa. Sun-dried leaf and flower are smoked in Tanganyika to "get in touch with the spirits." Ingestion may impart a body odor repellent to mosquitoes (Burkill, 1966). Believed to be aperient and tonic, the volatile oil is used as a counterirritant and stimulant. In Java the plant is used as an antisyphilitic emmenagogue. Leaves applied to the forehead are said to relieve headache (Burkill, 1966). In Korea, the seeds are used for abscesses, colds, lumbago, rheumatism, and stomach disorders. Chinese eat the leaves in soups for bladder, inflammation or hemorrhage. Mustard oil is used for skin eruptions and ulcers (Perry, 1980).
. takana raisu 高菜ライス fried rice with takana . sushi with takana leafy vegetable . 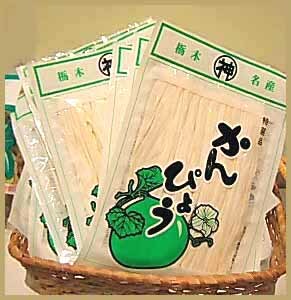 a form of takanazushi. 高菜 takana leaves are marinated in nibaizu or sanbaizu vinegar and then the warm leaf wrapped around sushi rice. rice wrapped in leaves . From the Back Yoshino area 奥吉野, made from wild takana, 高菜, (mana マナ, harumana 春真菜) wrapped around hot cooked rice. It is the first harbinger of spring in Yoshino. Woodworkers and forest workers used it as a bento lunch paket. 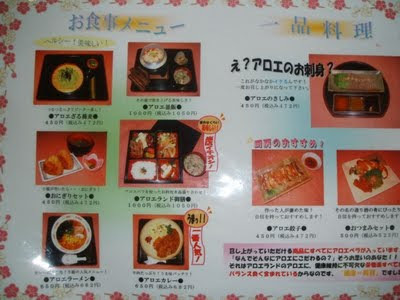 The names comes from a wordplay, with "opeinig your eyes wide when seeing this huge lunch paket" "me o miharu hodo okii". Also eaten in Mie and Wakayama prefecture.
. takanazushi, takana sushi 高菜ずし sushi from takana leaves .
. INDIA SAIJIKI ..... (WKD - INDIA) . adorn the Indian state of Punjab (my homeland!). 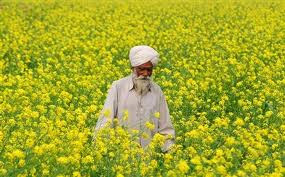 During the Sarson season, Punjabis will eat a puree of mustard greens and spinach literally every day for lunch. These greens have a deliciously addictive bitter taste that is insanely good for you. In parts of Northern Russia they are planted in summer to fight the weeds in the fields. 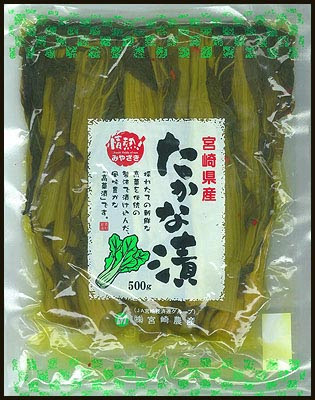 Takanazuke 高菜漬 pickled mustard greens are a well-liked side-dish in Western Japan. Many housewifes still do their own mix. ***** . Mustard plant (karashina 芥菜). and more about MUSTARD ! 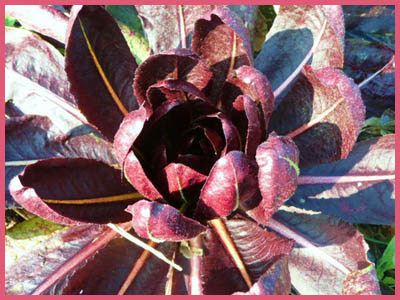 The plant contains large amounts of iron, phosphorous and calcium. Torii Tadateru brought them to Shimotsuki province in the Edo period. From Tochigi along the Tokaido to Minokuchi. The stripes are about 5 cm wide and 2 mm thick before drying in wind and sunshine, on a rainy day under plastic roofs. Hung up in the morning, they are done by evening. They are cut off the large fruit with a special cutting device. 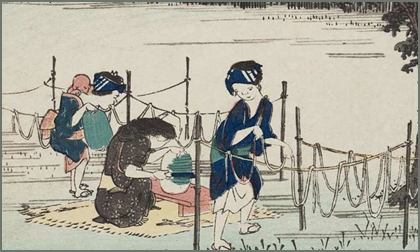 The local farm wives take the inner parts with the seed (nakago) and prepare simple dishes after cutting them to pieces and peeling off the seeds. 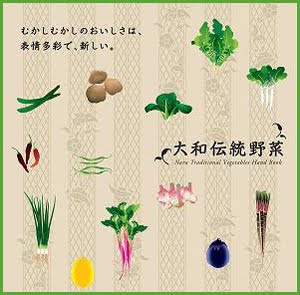 Mixed with other vegetables, or with an ankake sauce or simply in miso soup are they a delicioud addition to the dinner table in the season. In Minokuchi, a secial dish is prepared at O-Bon for the ancestors. Kanpyo and green peppers (ao toogarashi) are boiled together and put as an offering on the family altar, with a prayer for a good harvest in the coming year.
. Dried food (kanbutsu) . cutting small stripes of calabash . The calabash is cut in long stripes with a maschine or by hand and then dried, best in the sunshine. New stripes are offered to the ancestors for the obon festival. Minaguchi is located in the modern city of Kooka (Koka) in Shiga Prefecture, Japan. This postal station was developed as early as the Muromachi period, as its location was convenient for travelers going to the Grand Ise Shrine and the Ise Bay. On the eastern border of Minaguchi-juku, the road split into three paths. On the western border, the post station also served as a castle town for Minakuchi Castle and was an important travel route. 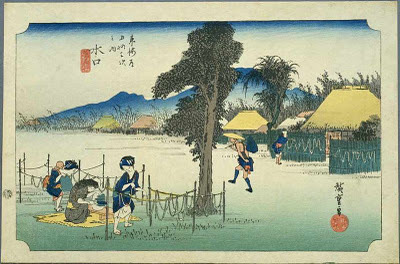 Since this illustration by Hiroshige was published, the Kanpyo from Minaguchi became famous all over Japan.
. Tokaido 50. 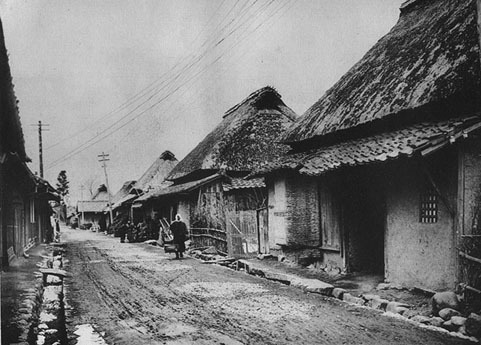 Minaguchi-juku (Kōka) . 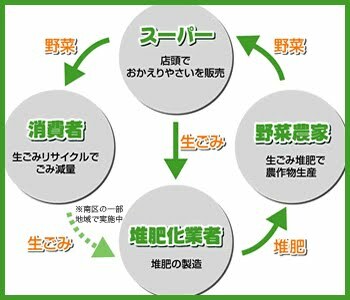 A recycling project from the city of Nagoya, started in 2008. Food leftovers from supermarkets in the city are collected and made to compost at Bio Plaza Nagoya. The compost is used on fields of group members to produce vegetables. Chives, bean sprouts, onions and many more are grown in this way. Local schools also get the vegetables for their school lunch and as education material for the children. this is the normal greeting for a person coming back home. It is not really the root, but but an underground stem with many holes. There are alwasy one small hole in the middle, two smaller ones on the top side and all around the middle one are seven other ones, altogether nine holes around the middle. Air is funneled through these holes to the plant. It is an auspicious food,since you can see through the holes of the root "into the future", saki ga mitooseru　先が見通せる, which is lucky. Therefore lotus dishes are always prepared for auspicious situations, festivals and the New Year food. and all about the symbolism of the lotus blossoms. The flowers of lotus play an important role in Buddhist philosophy. 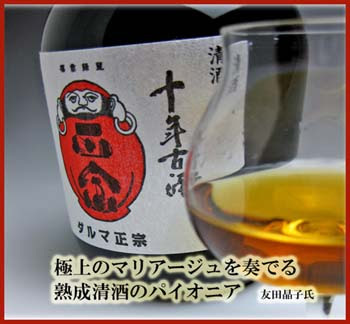 Renkon is well loved and prepared as a speciality in some prefectures. Served at the O-Bon ancestor festival.
. Bon Festival, O-Bon, Obon お盆 . In the background is the pond Shinobazu no Ike in Ueno, famous for its lotus and the island with a shrine of Benten. 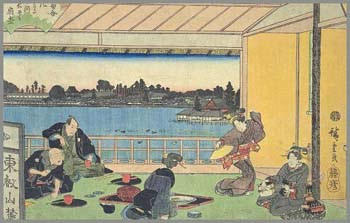 Parties for "lotus blossom viewing " (hasu no hanami 蓮の花見) were quite popular. A party of writers of comic verse (kyooku 狂句) in 17 syllables is having a party after the poetry meeting. prepared with lotus seeds and leaves and salted rice. rice with lotus leaves, with the rice wrapped in a lotus leaf. The rice is cooked with this wrapper. Other recipes prefer to boil the lotus seeds and leaves and use the broth to cook the rice. It is used as medicine against sleeplessness and also helps with diarrhoe. It can be served in soup or as a sweed desert. salted fish spills over . . .
shikon nori 紫金苔（しこんのり）"purple golden nori"
jusen nori 寿泉苔 "nori from the well of long life"
akizuki nori 秋月苔（あきづきのり） "autumn moon nori"
It is now a natural treasure 天然記念物指定. Along the upper regions of the river Koganegawa, along about 500 meters, water is divided into small shallow rivulets, where the alga grow on especially planted grass. They need a lot of mineral in the water and a temperature of about 18 - 20 degrees centigrade. Most of it floats in the water as small black pieces, until it catches some grass to grow larger. It is rather wobbely and jelly-like when harvested. 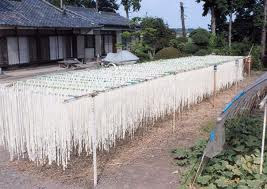 It was allowed to be harvested by the lord of Akatsuki Domain, who gave a written report to a family in Asakura, which still harvests and produces it in the traditional way by hand. So it has a tradition of more than 250 years. About one kilo of the mashed laver is spread on earthen tiles, about 1 cm thick, and let dry naturally. After that the rather flat pieces are now put on wooden planks, smothered with a bit of water into perfect shape (about A4 sixe plates) and let dry again. Before eating, it can be put into water to gain back its thickness. 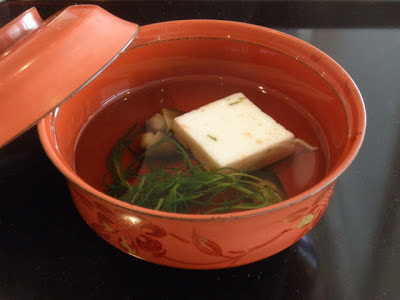 Put in soup or as tsukudani, it is a welcome source of minerals. 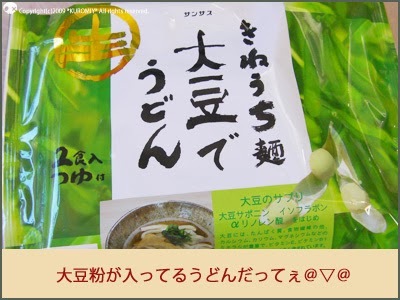 Suizenji Nori Salad with sanbaizu vinegar or Tosa Vinegar. River Koganegawa belonged to the former domain of Akitsuki han 秋月藩. The nori have been found near the temple Suizen-Ji 水前寺 at lake Ezuko 江津湖. These sweet-water nori are the first plants to bring oxygen to the earth in early times. On his trip to Higo Kumamoto, where he was eager to savor the nori, which were already famous in his days. Soup is usually served at the end of a meal, or sometimes eaten during a banquet. Basho found it amazing to get the soup first when he wrote his haiku about it. It grows in Hakata bay and is a local souvenier. 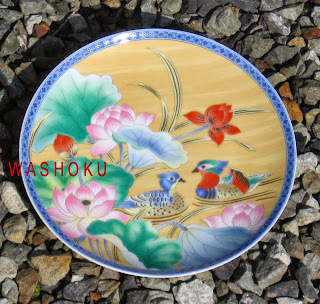 It has been collected by woman divers (ama) of the Genkai Sea for more than 200 years. Local people eat it with soy sauce for breakfast. It is low in calories and became a popular diet food in recent years. This is a new, or rather old, type of the satsuma sweet potatoes. It has been grown in Tanegashima for many years, trying to breed it back to the origins of this kind of potato. It is rather round, not long as the satsuma potato. And its color when boiled is pure gold, just so delicious ! When you roast it in the oven, the sweet juices, like honey, squeeze out of the peel. Tanegashima is one of the oldest growing areas of this potato. Its sugar content is about two times more than that of normal satsuma potatoes. So it is a natural "sweet desert". You can eat it just like that, baked in the microwave or in the oven. It is also used for other sweets, like pound cake or cookies. 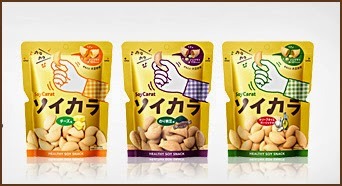 They have been grown in Japan for a long time and have taken on a special taste of the earth of each region. They were the source of inspiration for the regional cuisine.